The Langenau Forest Spur Trail in Wilmot starts at the parking area (P) along Messer Road (right turn from Granite Hill Road at the top of the hill). The trail passes through a gate in 0.15 miles (the gate is the actual trail head with a sign). The trail passes an active beaver pond, ascends 130 feet, then descends 300 feet to its junction with the Webb Forest Interpretive Trail and the Wolf Tree Trail (SRKG) at the New London - Wilmot town line. 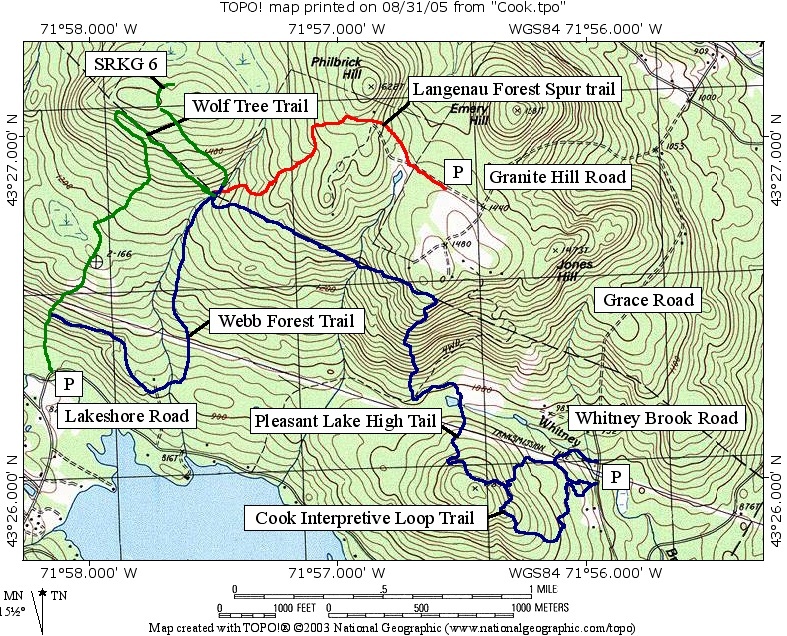 The trail, indicated in red on the map, is 1.1 miles long. The elevation profile shows distances measured from the parking area on Messer Road.